It may be October, but the MLB regular season lives for one more day. In addition to the Dodgers and Rockies playing to decide the N.L. West, the N.L. Central will also require a 163rd game to determine a champion between the Chicago Cubs and Milwaukee Brewers. The Cubs will host Monday’s matinee at Wrigley Field with the winner being awarded the Central division crown as well as home-field advantage in the National League playoffs. The loser, meanwhile, will host Tuesday’s National League Wild Card Game, the winner of which will face the N.L. Central champion in the NLDS. The Brewers enter Monday’s game as one of the hottest teams in baseball. Milwaukee closed out the season with seven straight wins. They also finished September 19-7, allowing them to pull even with the Cubs at 95-67 on the season. The Cubs, on the other hand, went a more modest 16-12 in September and 4-3 over the past week. It’s also worth noting how these two teams matched up against one another during the season. Chicago won the season series 11-8, which is why Monday’s game is at Wrigley Field. 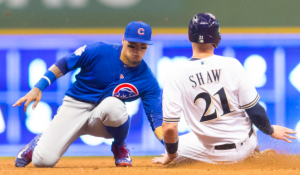 However, after the Cubs won eight of the first nine head-to-head games with the Brewers early in the year, Milwaukee has taken seven of the last 10, including four of the six games these two teams played against one another in September. With the division on the line, the Cubs will send lefty Jose Quintana to the mound Monday. Quintana has had a rather uninspiring season based on his track record. In 31 starts, he’s 13-11 with a 4.09 ERA. However, he won both of his starts against the Brewers in September. In both outings, Quintana went 6.2 innings, giving up a total of two runs on eight hits over those two starts, so he’s had considerable success against Milwaukee’s left-hand heavy lineup. The Brewers, meanwhile, declined to name a starter on Sunday night. Jhoulys Chacin would seem to be the most likely candidate. He went 15-8 with a 3.56 ERA and would be pitching on regular rest, so he would seem to be the safe bet to start. In two starts at Wrigley Field this year, Chacin allowed just one earned run over 12 innings, so he should feel confident against Chicago’s lineup if he ends up getting the call. If not Chacin, Chase Anderson could be another option. He’s pitched well at Wrigley Field this season. However, he hasn’t made a start since September 18. For the Brewers, Mike Moustakas could be the X-factor. While Quintana has dominated MVP candidate Christian Yelich, he’s been less successful at getting Moustakas out. Moustakas is familiar with Quintana from his time with the Royals and Quintana’s years with the White Sox. “Moose” is 12 for 46 (.261) with three doubles and three home runs in his career against the southpaw. If the Brewers get a big hit from a lefty against Quintana, don’t be surprised if it comes from Moustakas. For the Cubs, the X-factor could be Daniel Murphy, who’s only been with the team for a little over a month. Chacin has great career numbers against most of Chicago’s lineup, save for Anthony Rizzo, Javier Baez, and Murphy. In 20 at-bats against Chacin, Murphy has eight hits, including a double and two home runs. He’s hitting a cool .299 with an OPS of .809 since joining the Cubs and could be a difference maker on Monday. Even with plenty of momentum behind the Brewers, the Cubs will be tough to beat at Wrigley Field. Milwaukee will have an edge in the battle of the bullpens late in the game. But the Cubs have grown accustomed to playing and winning pressure-filled games the past couple of years. Even though the season isn’t on the line, there’s a lot at stake in this game, and the Cubs will find a way. Chicago wins 7-6. Note: This prediction is the opinion of the author and not necessarily the prediction of Jon Price or Sports Information Traders.